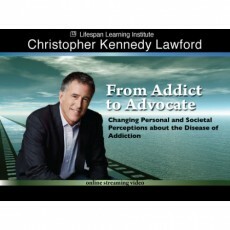 "In this video Christopher Kennedy Lawford gives a powerful presentation on the perceptions of addiction. He describes his own 23-year journey of recovery and what it takes for him to stay sober. Addiction is a chronic brain disease, and the cure is not to just get rid of the drugs and alcohol but to deal with the underlying reasons for the addiction in the first place. Just as a diabetic has to modify their diet and possibly take insulin, the addict has to continually live by a different set of rules than the non-addicted person. Finding out who he truly is through recovery has been the greatest gift he has found.